The American Late Model Series presented by Sunoco Racing Fuels made its first of four stops this season at Oakshade Raceway on Saturday night. With threatening skies looming, Jeep Van Wormer held off an exciting late challenge from Justin Paxton to win the ALMS Feature. Shortly after the conclusion of the Late Model and Sportsman heat events, the rain began to come down in buckets, delaying the rest of the night’s events. The Oakshade crew worked diligently to get the greasy track back in racing condition once the race had past. During the delay, Dan Rice and his intermission program aimed at the younger race fans called the Links Zone kept the crowd entertained by giving away 26 brand new donated bicycles making a bunch of kids very happy that night even with the soggy weather conditions. The track had changed significantly after the rain shower by narrowing the racing groove up to the outside with the inside of the track still a bit slippery, but by feature time, the inside had begun to get worked back in. Duane Chamberlain from Richmond, Indiana started on the pole led the first lap of the 30-lap ALMS Feature, but the yellow flag flew early for Dusty Moore. Jeep Van Wormer was second behind Chamberlain for the restart and tried to get to the inside. Jeep’s car jumped sideways and he had to check up allowing Rusty Schlenk to take away second. With Chamberlain continuing to lead after a couple more cautions in the first few laps, Van Wormer reclaimed second getting by Schlenk on a restart. Van Wormer took advantage of another caution after Hillard Miller spun on lap four by passing Chamberlain for the lead on the ensuing restart. Van Wormer began to pull away during a long green flag run with Justin Paxton working his way up to second by lap 13. Paxton began to close in as Van Wormer worked through lapped traffic. Chris Keller brought out the final caution on lap 26 after getting into the front stretch wall which set up a four-lap dash to the finish with clear track ahead of the race leaders. Van Wormer got a good jump on the restart, but Paxton didn’t let the 55 car get away. Paxton took one final shot at the lead as he dove to his inside going into turn three on the final lap. Paxton and Van Wormer were side by side through the corners, but Van Wormer had the momentum coming off turn four on the outside to pull ahead and win the $2000 ALMS Feature. Aaron Scott got by Chamberlain to finish third and Rusty Schlenk fell back to finish in the fifth position. With some more weather approaching the area, the UMP Sportsman Feature took to the raceway with John Hadley starting on the pole. Hadley lost it in turn two on the first lap and spun in front of the entire field causing a huge pile up and a complete restart. The unofficial Sportsman points leader, Josh Steinacker, failed to make his heat event earlier in the evening and had to race his way in to the feature through the consolation race which he won after starting at the back of the field. Steinacker, last week’s feature winner, had his work cut out for him once again starting deep in the field for the feature. Former Sportsman Track Champion Chris Smith took over the pole starting position and quickly took command of the race. He pulled out to a big lead over the rest of the field with Steinacker working his way up to fifth by lap six. Terry Stratton spun after going a lap down just past the halfway point of the race to bring out the yellow flag which tightened the field back up behind Chris Smith. Steinacker jumped to the outside of Brian Fisher on the restart to battle for second. Steinacker completed the pass and then reeled in Smith. Smith had to check up for a lapped car which allowed Steinacker to take the lead with just two laps remaining. It was the second consecutive feature win for Josh Steinacker whose worst feature finish this year has been a couple of second place finishes the first two weeks of the season. Smith settled for second followed by Brian Fisher, Tim Fisher and Mike Jessen with another top five finish. Immediately following the conclusion of the UMP Sportsman Feature, the skies opened up once again raining out the final three races (Bomber Features) of the night. Those will be made up on Saturday, June 2 with double features for the UMP Bombers. It will be a regular show for the UMP Late Models and UMP Sportsman with gates opening at 4pm and racing at 7pm. Rick Delong from Whitehouse, Ohio is heating up an exciting UMP Late Model points race early in the season at Oakshade Raceway holding off points leader Rusty Schlenk to pick up the feature win Saturday night. Delong entered the night just seven points behind Schlenk unofficially in the UMP Late Model point standings at Oakshade and it didn’t take long for the 3D car to get to the front in the Late Model Feature after starting on the outside of the third row. Kevin Reeve got the jump on Rody Schroyer at the start and led the first three laps until Delong ran him down and made the pass. Delong then began to pull away until the first and only caution flag flew on lap six after Ky Harper spun in turn two. Delong opened up a big advantage on the rest of the field once again after the restart and appeared to be the class of the field. Rusty Schlenk started 14th and positioned himself in the top three with just a handful of laps left. Schlenk got by Reeve for second but ran out of time before he could try to reel in Delong. Kevin Reeve held on to finish third ahead of Curtis Roberts and Chris Keller. In UMP Sportsman action, Mike Jessen grabbed the lead from outside the front row early in the feature event with Josh Steinacker pressuring. Steinacker had two second place finishes in the previous two events and was looking for his first win of the year. Steinacker took the lead from Jessen on lap three and finally looked like he was on his way to victory. Rusty Schlenk was once again trying to play the role of the spoiler after starting deep in the field and working up to second a good distance back from race leader Josh Steinacker until a debris caution tightened the field with just two laps remaining. Schlenk got to the inside of Steinacker for the lead on the restart and kept the pressure on in the final two laps, but Steinacker finally got his first win of the season and added to his UMP Sportsman points lead at Oakshade. Mike Jessen had another respectable finish in third. The veteran Tim Fisher was fourth and Brian Fisher finished fifth. Tom Ordway has been dominant in the UMP Bomber division at Oakshade this year with two consecutive A Main wins, but he would have his work cut out for him if he were to make it three in a row with having to start 12th. Tim Shelley, Garry Domoe and Chris Henry put on a great show for the lead with Henry eventually getting by Domoe and Shelley by lap six. Domoe didn’t give up too easily and battled back along the outside of Henry, but Henry fended off the challenge. Shelley, who led early, was involved in a wreck in turn one with Kyle Light which brought out the caution on lap 10. Jim Scout had worked up to the third spot on the track, but retired to the pits under the caution period. Another late caution set up a one-lap dash to the finish with Chris Henry leading Domoe and Tom Ordway, who was now third. Chris Henry, a Jackson, Michigan native, held on to take the checkered flag and his first A Main win of the year. Domoe took second and Ordway had to settle for third. Craig Dippman and Dan Dippman filled out the rest of the top five finishers. A crash-filled Bomber B Main was up next that saw Jeff Geis jump to the lead at the start, but a yellow for Dave Sibberson, Mark Pollack and Billy Brown set up a complete restart in which Hugh Snell got the jump to the early lead. Karl Spores Jr. assumed a short-lived lead on lap five. Spores got by Snell on the inside and thought he had him cleared. Spores moved up the track and clipped the nose of Snell which resulted in Spores spinning into turn one and he then got collected by Brad Blonde who managed to continued on. During another caution period a couple laps later, race leader Hugh Snell retired from competition turning the lead back over to Jeff Geis with Rob Price in second. Those two drivers put on a heck of a race in the final laps with Price getting by Geis for the lead, but Geis dove back to the inside and won by the nose of his car at the finish line. Danny Hogrefe finished third followed by Brad Blonde and Ronnie Leonard. Kaleb Eck and Kenny Fiig made the start of the Bomber C Main interesting as Eck grabbed the lead at the start and then lost a wheel down the backstretch that Fiig found as he ran it over ending both drivers nights. That allowed Jeff Krotzer to take over the lead on the restart until Rick Dixon got by on lap seven. Krotzer and Dixon traded some paint as Krotzer forced his way back into the lead, but Dixon fought back and took the lead for good on the next lap. Craig Turner got by Krotzer to finish second behind Dixon. Jeff Strock finished fourth and Justin Woodruff came home fifth. Make sure to include Oakshade Raceway in your Memorial Day weekend plans for the first $2,000 to win American Late Model Series show along with the UMP Sportsmen and UMP Bombers. It will be a fun night for the entire family as it is also the Links Zone Night of Wheels where a good number of kid’s bicycles will be given away. Gates open at 4pm with racing at 7pm. For more information, visit www.oakshaderaceway.info. 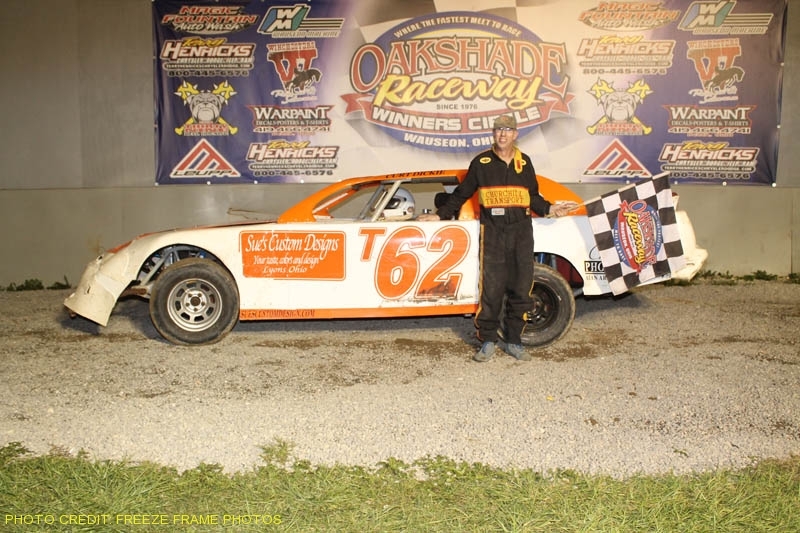 Three-time Oakshade Raceway Late Model Track Champion Justin Paxton was back in championship form Saturday night with an impressive victory in the UMP Late Model Feature at Oakshade after not making the main event the week before. Aaron Scott closed in on Brad Eitniear for the lead early in the 25-lap UMP Late Model Feature until Scott slipped up high in turns one and two and fell back to fifth on lap seven. Paxton started on the outside of the third row and just after Scott’s slip up, Paxton darted to the outside of Eitniear for the lead and then drove away. Eitniear, Ronnie Perrine, Jr., Rick Delong, Casey Noonan and Aaron Scott then engaged in a great battle for the second through sixth positions as Paxton continued to pull away with the lead. Eventually Perrine and Delong emerged as the two drivers vying for the second position almost a half track behind Paxton. Paxton put the bad luck from the previous week behind him by picking up the victory uncontested in the caution-free feature. Rick Delong fended off Ronnie Perrine, Jr. for second. Sylvania, Ohio’s Casey Noonan finished fourth with last week’s feature winner Rusty Schlenk taking fifth after starting mid-pack with just behind Noonan. Chris Smith had a run of five consecutive Sportsman track championships from 1998 to 2002 and was also back in championship form leading the UMP Sportsman Feature from start to finish. Mike Jessen ran second most of the race and was able to mount a challenge on Smith just before the halfway point in the race. Jessen got to the inside and actually led lap nine by a nose before settling back behind the 94 car of Chris Smith. Josh Steinacker moved up to third by lap 13 and then pressured Jessen for second in the remaining laps of the race right behind Smith. Smith went on to pick up the victory with an exciting race for second just behind him with Steinacker edging out Jessen at the line to finish second for the second week in a row. Joe Derbeck finished fourth behind Jessen with Tim Line ending up fifth. With Chris Henry leading early in the UMP Bomber A Main, Harold Rieger was in second and then spun in turn two on the second lap collecting the 74D of Craig Dippman. Both cars were able to continue but had to restart at the tail of the field. Gary Cole was flying up through the field taking second by lap three after starting in the seventh position. Just behind him was Toxic Moe who got crossed up on the backstretch and collected Randy Roseman ending both drivers’ night. Cole became a non-factor in the race after he spun on lap five and brought out another yellow flag. Meanwhile, defending Bomber Champ Tom Ordway quietly moved into second position and took over the top spot from Henry one lap after the restart. Henry battled back to the outside of Ordway, but Ordway held him off and went on to pick up his second consecutive UMP Bomber A Main win. Chris Henry fell off the pace and came to a stop on lap 10 giving up a possible second place finish. Brian Przepiora was second at the finish followed by Brett Miller (who started last), B.J. Gregory and Jeff Foks, Jr.
Garry Domoe put on an exciting finish in the UMP Bomber B Main winning by just a nose. Domoe took the lead at the start with some good battling just behind him. Wade Rick was trying to get to the inside of Cliff Bernard for second but didn’t know Jim Scout had gotten a nose just to his inside. Rick clipped the front of Scout’s car and both drivers went spinning into turn one bringing out the caution flag. Curt Lancaster got up to second with two laps to go and then got by Domoe on the final lap for the lead, but Domoe battled back to the inside in the final set of corners and just beat Lancaster to the line. Bob Rendel finished third with Cliff Bernard and Josh Montague fourth and fifth respectively. The UMP Bomber C Main was marred by a slew of caution periods. The first of which came out when the leader Craig Turner spun in turn three turning over the top spot to Justin Woodruff. Donovan Paskin and Richard Riffe were battling hard for second and made contact which broke the steering on the 53 of Paskin ending his night early. Riffe continued on and eventually took the lead from Woodruff briefly. Jim Plotts from Holgate, Ohio assumed the lead on lap four and went on to win ahead of Billy Brown and Dewaine Slater. Richard Riffe fell back to finish fourth and Ron Bloomfield was fifth. Save $2 off adult general admission tickets on Saturday, May 19 courtesy of Country Charm Cafe in Metamora, Ohio featuring UMP Late Models, UMP Sportsman and UMP Bombers.